This is always a challenging question since a "video" production is not an off-the-shelf-premade product. Most Videos are CUSTOMIZED projects filmed and edited to fit the clients needs and budgets with specific technical requirements and time investements unique to the project. Therefore the definition of a "VIDEO PRODUCTION" is so broad the budgets can range anywhere from $200 to $2000, or even $20,000 depending on the SCOPE AND GOAL OF THE VIDEO wich will determine how much professional work time and equipment investment is required to complete the video and produce a quality release. To ballpark your average video production budget would need roughly $500-$1000 for every completed minunte of the final video for videos with heavy editing or $200 - $1200 for most Live event recordings to cover professional gear crew , supplies, transport and post production studio time. While We do have promotional pricing for a bundle of services for our Business Entreprenuer or our Live Music Performer clients these are premade cookie cutter video production service bundles of specific services with time estimates and most costs pre-factored in. 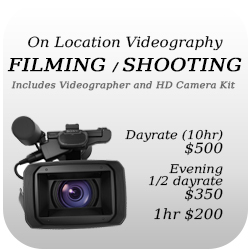 So our production costs start at $350 for 1/2 a day and $500 for a full day (per crew member per day) for filming on location or editing in the Studio to cover our costs for labor,professional HD video eqipment and supplies. Most projects need 1-3 crew each day to shoot / film on location and they can take 1-5 days in the post production studio to edit, add graphics, titles, credits, contact information and output final video on disc or youtube upload - All depending on how simple or complex the project is. 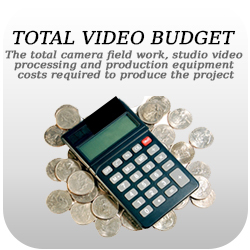 There may also be additional costs for projects requiring extra spedific production equipment, lighting, mics, extra cameras, digital recorders, special rentals. 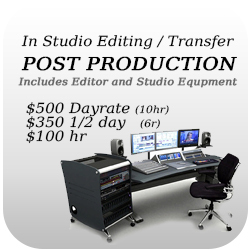 scriptwriting, actors, extra crew, music licensing, props location fees or permits or translation services etc. Alternatively rather than just asking "how much?" it may be easier to work backwords - if you CONTACT US to discuss what you need or your ideas and goals for your video with the budget you have to work with and how much you want to invest and we can provide you with a matching proposal. What if I have no budget to work with? Can I get FREE or volunteer video work if I tell all my contacts about you or promise to bring you in on the next big project down the road? Can I get Free volunteer video work in exchange for our event tickets or our merchandise? What if my cause is noble like "True love" or "to-blave?"